The 2018 brochure has been mailed out with your annual Maintenance Fee invoice. Please read your brochure in detail. 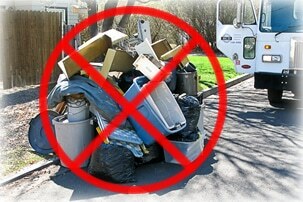 The biggest change for this year is that there will be no big garbage pick-up in either the Spring or the Fall. Those needing to get rid of large garbage items can still take it to the Band landfill (fees are outlined in the brochure) or have it picked up by the Works Department ($40 fee is the same as last year). And as was the case last year, items left out for others to take that are by the road for longer than 2 weeks will be picked up by the works department and cottage owners will be invoiced $100. Anyone caught discarding garbage at the gate to the landfill or elsewhere on the band lands will be charged by the OPP with trespassing and littering. Last year it was obvious that many cottage owners had not read the brochure carefully with the result that a number of $100 invoices were issued for items discarded by the road. If you see that a neighbour has left items at the road for longer than a week, please bring these changes to their attention. Recyclable items are the same as last year. Only tin or aluminum food and beverage containers can be recycled along with plastic food and beverage containers and plastic household laundry and detergent containers. Glass of any kind and paper products including cardboard are not being recycled at this time. Please do not put these items in your blue bin because it only slows down and increases the cost of the collection process. The Band is working on ways to have these items included once again in their recycling program but have been unsuccessful so far. We will receive notice of any changes and update the website immediately. Please also make those who use your cottage aware of the items currently included in the recycling program. And also please note that Service Fees are due April 1st and are to be submitted separately from your Lease payment. Well if there If no big garbage pick up I hope the band does not increase our fees. Garbage pickup is hit and miss as is. A lot of the garbage being left on the beach is not being left by cottagers, but by other people who use the beach. Cottages should not be blamed for rules being broken on the beach. For example we have seen many campers bring their pets to the breach or walk them on the beach when it is not being paroled by security. Rules are not just for cottagers. We have seen security drive right by people with dogs on the beach and they don’t do anything to enforce the rules. Just saying rules should be for everyone enjoying the area and beach! Garbage on the Main Beach has been an issue for quite some time. The Band does not see the problem as one created by cottagers. In fact SCOI for several years in a row has raised this issue with the Chief and senior Band staff. The band has taken steps to deal with the issue, especially on busy days and long weekends. The beach crew last year acquired a compacting truck which allows them to more quickly and more efficiently collect garbage from containers on the main beach and to help them stay ahead of the volume and the birds/wind. There were more garbage containers placed on the Main Beach and the Beach Crew were making extra rounds on weekends and later on days when there had been a big crowd. This issue will remain on our list of things to be raised with the Band. Will not be back in Ont until Apr 6. Assuming we have 30 days (til Apr 30) to pay service fees as in past years. Gerry, we hope you are someplace warm and sunny. Paying your Service Fee after the deadline is not a SCOI issue. April 1st has been the deadline for many years, so we’re not sure if the Band tolerates late payments. We assume the brochure makes note of the late fee for a reason but you can call the Band’s Land Management Office (519-797-3039) to see if they are OK with you submitting your Service Fee payment late and without penalty. Is it possible to drop off recycling such as glass, paper, newspaper and cardboard in Southampton or Sauble? The South Bruce Peninsula landfill is north of Sauble Falls on the right side about ¾ of the way to the Oliphant stop sign. You can see the scales from County Road 13. As you go in, just before the scales, on the left is an area full of bins where you can drop your recycles off. A few years ago the Band responded to SCOI’s request to increase the annual service fee a bit each year rather than keep it the same for several years and then less frequently raise it by a large amount. This was in response to many cottage owners who asked for the change because when the amount is quite large, many families find it difficult to budget for and accommodate a big jump especially with the short period from notification to due date. However, this year the Service Fee actually went down from $875.50 to $875.00. When the SCOI executive meets with the Chief and the Band’s senior management team later this spring, we will once again remind them of the need to raise the fee in small increments annually. Not all of us are interested in annual increases, small or otherwise. And especially not interested when services are reduced and/or not provided as stated. I too have noticed that weekly pickup is spotty, and not just in the shoulder seasons. On occasion I return a week or 2 later to find my garbage still in the bin. We’ve been cottagers many years and it is noticably worse. I haven’t been a big user of big garbage pickup but it’s been handy a couple of times. I’m generally supportive of pay per use models, but would expect to see reduced price or reduced service. Then those who need extra pay for it. So effectively, we are already all paying more for the reduced level of service considering we have to deal with certain standard recyclables ourselves and have lost both big garbage pickups. I would support a tag system,as many communities already have, as long as I don’t have to pay $875 for nothing and then buy the tags. I agree with Heather that our service fees should be reduced for less service we’ve received last year and even more this year. This should be addressed.